Single-vehicle run-off-road crashes are the most common crash type on rural two-lane Iowa roads. Rumble strips have proven effective in mitigating these crashes, but the strips are commonly installed in paved shoulders on higher-volume roads that are owned by the State of Iowa. Lower-volume paved rural roads owned by local agencies do not commonly feature paved shoulders but frequently experience run-off-road crashes. This project involved installing rumble stripes, which are a combination of conventional rumble strips with a painted edge line placed on the surface of the milled area, along the edge of the travel lanes, but at a narrow width to avoid possible intrusion into the normal vehicle travel paths. 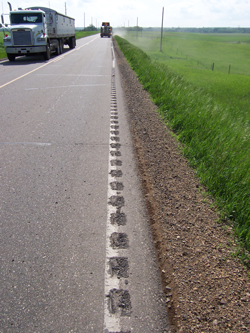 The research described in this report was part of a project funded by the Federal Highway Administration, Iowa Highway Research Board, and Iowa Department of Transportation to evaluate the effectiveness of edge-line rumble strips in Iowa. The project evaluated the effectiveness of rumble stripes in reducing run-off-road crashes and in improving the longevity and wet-weather visibility of edge-line markings. This project consisted of two phases. The first phase was to select pilot study locations, select a set of test sites, install rumble stripes, summarize lessons learned during installation, and provide a preliminary assessment of the rumble stripes’ performance. The purpose of this report was to document results from Phase II. A before and after crash analysis was conducted to assess whether use of the treatment had resulted in fewer crashes. However, due to low sample size, results of the analysis were inconclusive. Lateral position was also evaluated before and after installation of the treatment to determine whether vehicles engaged in better lane keeping. Pavement marking wear was also assessed.